For more than 50 years, media ethics professor John C. Merrill has been championing and criticizing the libertarian model of the press. In Media, Mission and Morality, he addresses a number of moral and theoretical issues, including the increasingly popular anti-libertarian views of postmodernists, communi-tarians and critical theorists. Their relativist, collectivist and subjectivist criticisms have many strengths, Merrill notes, but they also harbor the threat of censorship as well as centralized control of mass media. To stave off such threats, Merrill says journalists need to do more than embrace ethics — they need to formalize their profession. "Numerous problems, of course, face such action. ... But making journalism a profession would, I think, result in higher and more consistent quality ... ." One need not embrace Merrill’s ideas to appreciate the contribution this essay makes to the literature. 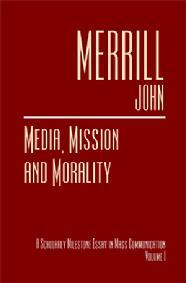 John C. Merrill is professor emeritus of journalism and mass communication at the University of Missouri-Columbia. He has been teaching, writing, and lecturing at American and foreign universities since 1950. He is author or coauthor of nearly 30 books, including The Elite Press, The Imperative of Freedom, Existential Journalism, Twilight of Press Freedom, Media Musings: Interviews with Great Thinkers, The Dialectic in Journalism, Legacy of Wisdom, and The Princely Press: Machiavelli on American Journalism. The Scholarly Milestone Essays in Mass Communication give leading scholars an opportunity to comment on major issues facing mass communicators and mass media industries. For more information, contact Marquette Books.